Havan or Homa is an age old sacred Fire ritual in Hinduism which has been performed since Vedic era in order to invoke the powerful energies of the Divine. This ritual is also performed to seek blessings of Gods and Goddesses by igniting the Holy Fire. In this sacred ritual, special offering are kindled in the Holy Fire while chanting the Sanskrit mantras. The ritual of Havan is conducted as per the Holy Vedic scriptures. The sacred Fire and the mantras fill the ambience with purifying and auspicious positive vibrations and thus benefit everyone who is attending the Homa in a splendid manner. It purifies the body, mind and soul, elevates spiritually, makes the mind calm and offers a sense of tranquillity. The rich Hindu rituals entail invoking the celestial presence of the Divine in the idols of the deities or in the Kalash (vase). But in this Kalyuga, due to pollution, the air, water and earth are all polluted and there are rare chances of them being pure. Hence, if there are impurities when the Kalash or the deity idols are being made, then invoking the divine presence in these idols or the Kalash would not be possible. Therefore, we put to use ‘Agni’ (Fire), as fire is the one of the two elements that cannot be polluted, the other being Akash (space). We cannot conduct traditional rituals in space hence; we carry out the spiritual sadhana through Fire. Also in Sanskrit fire is known as "Pāvaka", meaning "one who purifies". Thus, the Fire element is one of the purest elements that purify everything that comes into contact with it. Havan Kund is basically a reservoir in which the sacred offerings are kindled. The Havan Kunds are energy centres where divinity is evoked. Various Havan Samagri which include wood, herbs and more are burnt inside the Havan Kund along with offering of ghee and Japa of various mantra to invoke positivity and various energies. The shape of the Havan Kund is said to generate a special energy field and also store this divine energy. The energies generated due to the Havan have properties which are bacteriostatic. The peculiar shape of the Havan Kund helps to generates, stores and spreads the divine energies in the surrounding atmosphere, thus filling the atmosphere with divinity. 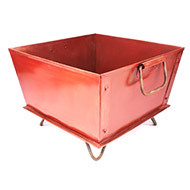 These Havan Kunds are generally used to gain Siddhis and to accomplish all the work. The Semi- circle shaped Havan Kunda is known as the Ardha Chandrakara Havan Kund which is generally used to get peace, happiness, and harmonious family life. 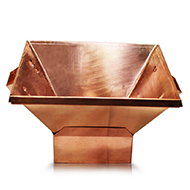 The triangle shaped Havan Kund are also known as the Trikonakara Havan Kund or the Trikon Kund. 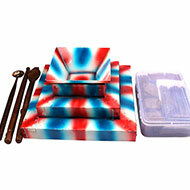 These Havan Kunds are designed in order to win over enemies. The Vrut Havan Kund is circular in shape. This Havan Kund is designed for peace and maintaining public welfare. 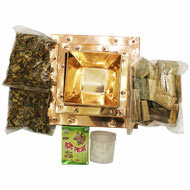 In order to win over unknown threat and enemies the Star shaped Havan Kund is used. This Havan Kund is known as the Pushtrkon Kund. 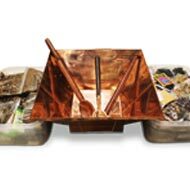 The Padma or the Lotus Havan Kund is designed to attract wealth and also to be protected against evil energies. The Heart shaped Yajna Kund is known as the Yoni Kund. 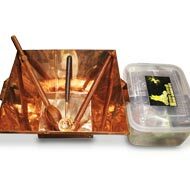 This Havan Kund is designed to manifest desires like attracting love and to conceive a child. The Star shaped Havan Kund is also known as the Pushtrkon Kund. The shape of this Kund is designed to win over the unseen and seen enemies. The Havan Kund with six angles is generally used for stopping death. 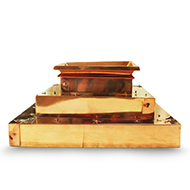 The Lotus shaped Havan Kund or the Padma Kund is especially designed to attract wealth. According to some ancient texts, The Padma Kund is also designed to protect one from evil energies. Homam or Yagya are one of the most powerful Vedic rituals that serve as a remedy to achieve Karmic evolution. Homam helps in burning the negative karmas of the past and paves way for a bright future. The process of performing the Yagya has been clearly illustrated in the ancient Vedic texts.